Popular debates focus on the political class, usually its alleged careerism and self-interest. In a post originally posted on the LSE British Politics and Policy blog, and providing an update on his research on the personal side of politics, James Weinberg deconstructs the term “political class” and presents some of his findings on the personal values of those who make it up. The political class, as a derogative term to denote certain people and as a metaphor for wider economic or social ills, is current in discussions of UK politics. In both popular and academic press, the political class occupy the centre-ground of an anxious debate about confidence in political institutions, actors, and processes – questions that have for some time underpinned broader concerns about democratic inequality. As Britain looks ahead to another general election, the gap between governor and governed will bubble to the surface again; parties enter into the gladiatorial ring for the ultimate prize in politics while voters watch on, contemplating whether the trip to the ballot box is actually worth it. Unified by a common distaste, popular conceptions of the political class often collapse to broad yet vague binaries of ‘them and us’, whilst the academic literature flits between a focus on unequal access to politics, the dominance of ‘the establishment’, and that smaller cadre of individuals in the cabinet of the UK government. In all cases there is a propensity to jump prematurely to the problems associated with the political class before conceptually delimiting ‘who’ is the object of research. Problem one. In addition to this conceptual ambiguity, there is a wider shortcoming implicit in accepted connotations of the political class such as careerism and self-interest – accusations that are broadly psychological in nature – that are not supported by the methodological tools to link cause with effect or to differentiate between individuals. This issue highlights an endemic lacuna in the political science literature: the lack of direct empirical research into politicians’ personalities and motivations. Problem two. Problem one. In cognitive and behavioural psychology, membership of any ‘elite’ group requires individuals to fulfil two criteria: they must control the deployment of resources and they must have large amounts of context-specific knowledge unavailable to non-elites. In such terms it is possible to delimit the political class as those holding formal political office, through which the institutions of politics have endowed them with (a) an asymmetry of information as compared to the general public, and (b) the opportunity (whether taken at the time of investigation or not) to advance their control over public resources through the career paths presented within the institution. Suddenly the political class is no longer an amorphous construct in which anyone receiving political patronage may be a member, but a clearly defined and researchable group of elected politicians at regional, national, and international levels of governance. This definition means that the political class retains a collective interest – a class for but not in itself in Marxian terms – without extending to include SpAds, party officials or QUANGOs that do not hold formal power in policy space. Controversial or not, the task of justifying one conception of the political class as an object of empirical research is necessary. Problem two. The problems associated with the political class require active research conducted with the correct methodological tools. A study at the Crick Centre (University of Sheffield) is blending the conceptual and methodological wisdom of political science and psychology to expand our understanding of the personal side of politics – issues that sit at the heart of the debate about the political class. In a growing yet representative sample, 98 MPs have completed validated psychometric surveys of their Basic Human Values. As a measure of personality, basic values are both more distal than perceptions or beliefs, and more proximal than traits. The theory of basic values has already been tested in over 74 countries and applied to explain a range of political opinions and decisions, including vote choice and party activism. 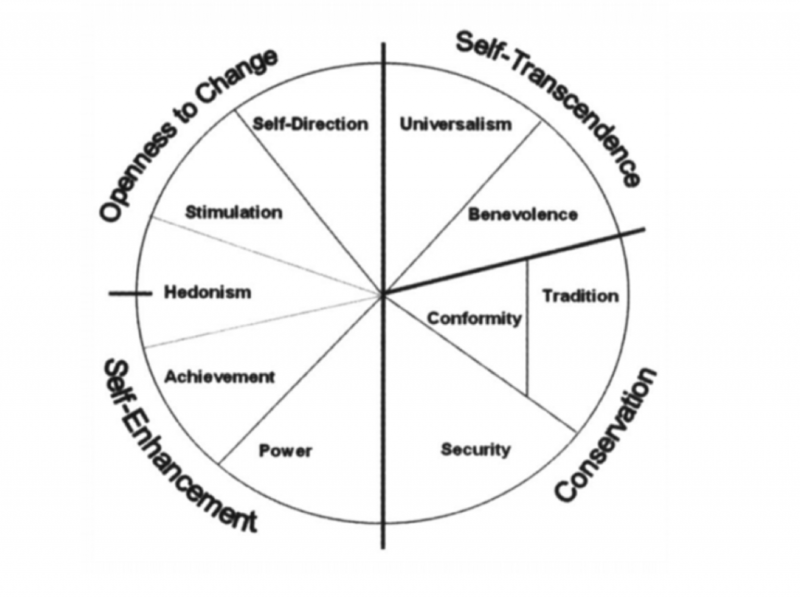 The theory specifies ten lower order value factors such as Power and Benevolence, which are in turn grouped in four higher order factors such as Self-Transcendence values. This data on MPs is the first collected with national male politicians anywhere in the world and the first with female politicians outside of Italy. It is being used alongside questions about political attitudes, behaviours and biometrics to get to the heart of how and why politicians navigate their experience of elected office. What is more, this rigorous body of data allows for substantiated discussions of ‘who’ politicians really are and ‘how’ they differ from the general public. Two broad findings are worth mentioning here. Fig.1 Basic Human Values and their interdependent relations in circular space. In the first instance it is evident that personality, or specifically basic values, act as internal factors that activate or deactivate individuals in a self-selection process for elite politics. As such there are substantive differences between the value profiles of the political class and those of the general British public (as measured by the European Social Survey with a sample of over 2000 in 2014). Seven of the ten differences in mean scores (for lower order values) between the two samples are statistically significant. For example: MPs are significantly more driven by motivations to care for those around them and support those they know personally (higher scores for Benevolence); they are significantly more driven by originality and self-determination (Self-Direction values) yet also more motivated to control resources and be in charge of others (Power values); and they are significantly less driven by motivations to preserve religion, tradition or to secure stability in their own lives or society (Conservation values). Given that large-n samples around the world have shown that basic values anchor political ideologies, these results are indicative of the democratic elitism previously found in the US – i.e. a highly liberal political elite (Self-Transcendence and Openness to Change values) representing a relatively authoritarian public (Conservation values). For committed ‘anti’-politicians there is an obvious contradiction here: the political class cannot be both more democratic in their transituational goals or motivations, and be folk devils of contemporary society. If we collapse MPs into frontbench and backbench (60/40 split in the current sample) these findings become even more revealing. Frontbench MPs differ significantly from the public on all four higher order values and six lower order values, whereas backbench MPs only differ from the public on one higher order value (Conservation) and four lower order values. This would suggest that personality is acting as an internal criterion for self-selection within MPs as well as between MPs and the public. This may sound self-evident but it has interesting repercussions, dependent on your subjective opinions of what constitutes a ‘leader’, for representative democracy. It implies that those actually making policy and running the country are the least like those they are representing. Conservation values are particularly topical in the context of Brexit if we consider that a relatively conservative public has voted for to revert to a past political situation, which will be carried out by politicians who are significantly less concerned about maintaining harmonious relations, stability or conforming to rules. Additional to this it is apparent that personality acts as an external criterion for selecting ‘winning’ candidates by utility maximising party selectorates – it influences recruitment to the political class. The data show that centre-Left and centre-Right parties differ considerably in the types of people they choose to represent them. Focusing on the two main parties in British politics, Labour and Conservative, we can observe significant differences on two higher order values (Self-Transcendence and Conservation) and three lower order values (Conformity, Tradition, Universalism), suggesting that Labour MPs are far more driven by a desire for justice and equality but also less motivated than Conservatives to sustain traditional ways of life. This again may sound self-evident but it suggests that a) party selectorates are still choosing candidates who express the values consonant with their traditional ideological base and not that of the median voter, and that b) clear substantive differences between the parties exist at the level of the individual. There is not the space here to elaborate on these findings further, but the data also point to interesting differences within the political class, and between the public and those representing them, on the basis of demographic variables such as age and gender as well as occupational backgrounds. Yet particularly poignant in the context of a general election in which turnout figures may once again reflect popular despair at the state of politics, and contra to rote accusations, the political class are not ‘all the same’. James Weinberg is a Research Associate at the Sir Bernard Crick Centre for the Public Understanding of Politics at the University of Sheffield. This piece was first published on the LSE British Politics and Policy blog, and is cross-posted with the permission of the author. This entry was posted in Blog and tagged House of Commons, MPs, Psychology, quantitative methods. Bookmark the permalink. ← Is the Fixed-term Parliaments Act a dead letter?